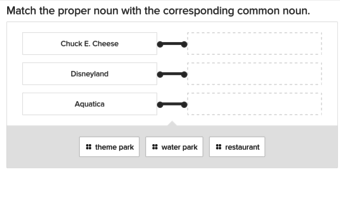 Keep your proper nouns proper with our proper noun exercises. Help your child learn how to properly write proper nouns with these quick drills. Pick out the incorrect written version of proper nouns in these sentences for proper noun practise. If they need a little more review, your child can back up and focus on just Parts of speechNext. Not all nouns are proper -- and we don't mean that some have bad manners! Some nouns, like peoples' names, places, and days of the week, get the proper noun treatment, which means they start with a capital letter. But only some, and learning which nouns are proper nouns and which ones aren't can take a little time. If your child is struggling with proper noun usage, help them learn to identify proper nouns and how to write them with our proper noun exercises. Our cool interactive exercises challenge kids to find the proper nouns in sentences and figure out exactly what's wrong with them. The sentences are easy to understand, and include a variety of proper noun types to make sure your student gets used to them all. Proper nouns are a big part of Language artsLearning, and a big part of everyday writing, too. Let us help your student master them.